As global central banks have tightened the noose during 2018, it isn't just stocks that have suffered. No major asset class has done well and, in most respects, the opportunity-set available to asset allocators this year has been among the worst in the last 50 years. 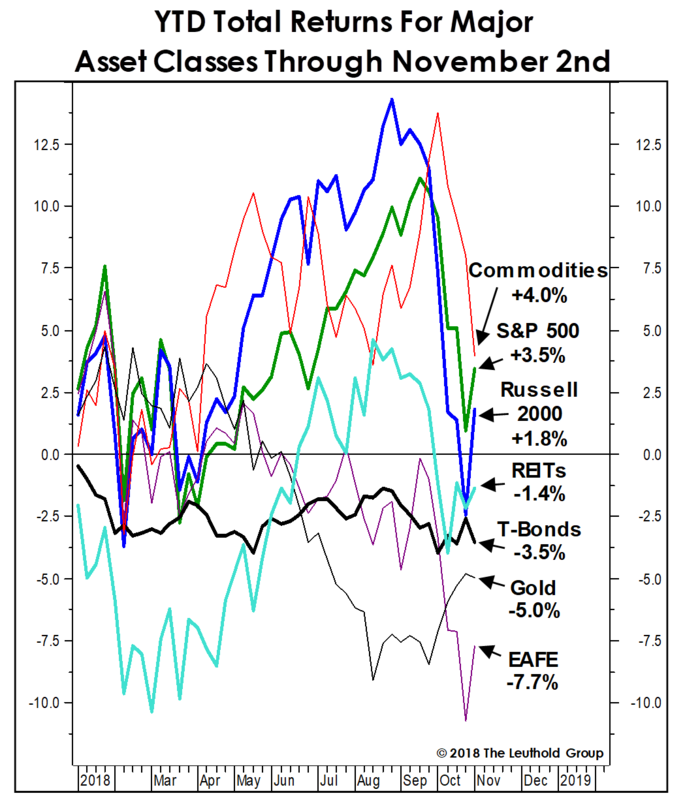 Considering Large Caps (S&P 500), Small Caps (Russell 2000), EAFE, REITs (NAREIT Composite), Commodities (S&P/GSCI), 10-year U.S. Treasury Bonds, and Gold, the top YTD performance spot is held by Commodities (despite an October setback). Historically, asset allocators would have been surprisingly well-served by owning all seven of these asset classes in equal weights (rebalanced at year end). During the 45 years ended in 2017, that portfolio would have nearly matched the S&P 500 total return (+10.2% annualized versus +10.4%, respectively), but with dramatically less annual volatility (11.7% versus 17.5%). CPI inflation over this period was 4% annualized, leaving a respectable real return of more than +6% annualized. Given this strategy’s required skill (none) and trading frequency (minimal), the results border on the remarkable. But this so-called “agnostic” asset allocation portfolio has fallen flat during 2018, delivering a total return of -1.2% through November 2nd. If a year-end rally doesn’t develop across most of the assets, there’s risk of a seventh down year in the 46-year (hypothetical) life of the strategy.